Congrats to http://c-grunge.deviantart.com/ for winning the main prize! 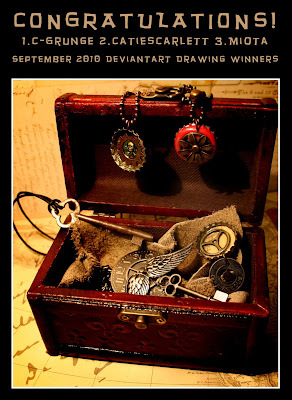 http://catiescarlett.deviantart.com/ and http://miota.deviantart.com/ will receive a mystery piece in the mail as well. A picture of the pieces will be online soon. Many thanks again to all my Deviantart Watchers! Keep an eye out for details about the Facebook Drawing coming soon!